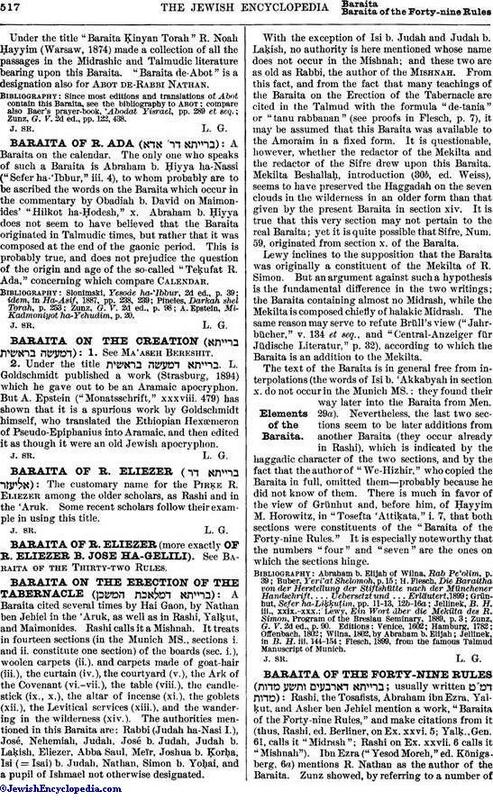 Rashi, the Tosafists, Abraham ibn Ezra, Yalḳut, and Asher ben Jehiel mention a work, "Baraita of the Forty-nine Rules," and make citations from it (thus, Rashi, ed. Berliner, on Ex. xxvi. 5; Yalḳ., Gen. 61, calls it "Midrash"; Rashi on Ex. xxvii. 6 calls it "Mishnah"). Ibn Ezra ("Yesod Moreh," ed. Königsberg, 6a) mentions R. Nathan as the author of the Baraita. Zunz showed, by referring to a number ofpassages in the Talmud, that the tanna R. Nathan, in the Halakah as well as in the Haggadah, was accustomed to group things arithmetically, and to arrange his sayings accordingly. On this observation, Zunz based the conjecture that "this lost work of R. Nathan contained a large portion of his Mishnah, and was arranged in rubrics from one to forty-nine; so that each rubric, under the introductory formula "Middah," mentioned halakic, haggadic, and, in general, scientific subjects which belonged in that particular place in regard to number" ("G. V." 2d ed., pp. 95-97). From the few fragments of this Baraita preserved by the above-mentioned authors, only one fact pertaining to its character can be ascertained, viz., that it contained haggadic (Yalḳ. l.c. on the seventy nations) as well as halakic matter, especially such portions of the Halakah as are concerned with exact measurement; for instance, the measurement of the Tabernacle and its furnishings (Rashi, l.c.). If from these short fragments an opinion could be formed concerning the composition of the Baraita, Zunz's assumption would be justified that it contained Haggadah and Halakah numerically arranged. Another assumption of his, however, that it represents the "Mishnat R. Nathan" mentioned elsewhere, is highly improbable; R. Nathan's Mishnah was in all likelihood only a version of Akiba's Mishnah differing from the authoritative Mishnah. Against Zunz's opinion, compare Eliakim Milsahagi. "RABIH," pp. 4b, 7b. Steinschneider believed that he had put an end to all conjecture concerning the Baraita through a happy find. In the introduction to an edition of the "Mishnat ha-Middot, die Erste Geometrische Schrift in Hebräischer Sprache" (Berlin, 1864), he maintains that this mathematical work, edited by him, is identical with the Baraita under consideration. Were this the case, the Baraita would be a product of the ninth or, at the earliest, of the eighth century, and its birthplace would have to be Babylonia. For, although the scientific terminology of this, the oldest, mathematical work of the Jews shows its origin to have been in a time previous to Arabic influences on Jewish scholarship, yet expressions like = Arabic ("arrow") for sinus versus, or = Arabic for measure, area, show that the work could not have been written before the contact of the Jews with the Arabs. But Steinschneider's assumption can hardly be supported. 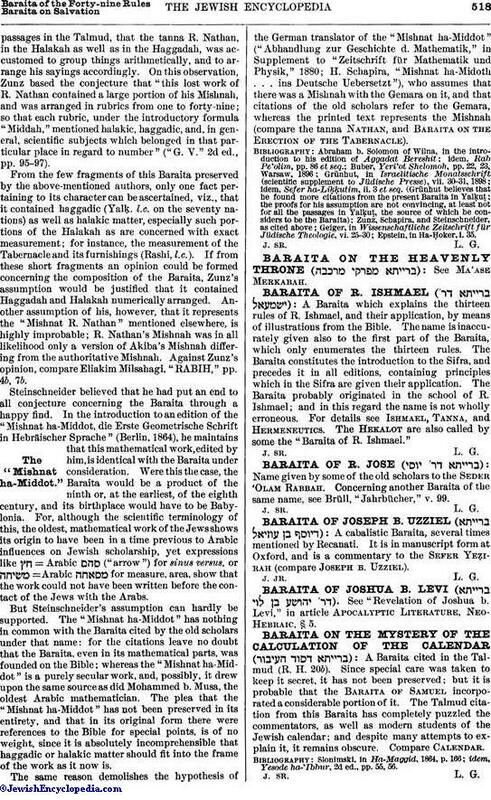 The "Mishnat ha-Middot" has nothing in common with the Baraita cited by the old scholars under that name: for the citations leave no doubt that the Baraita, even in its mathematical parts, was founded on the Bible; whereas the "Mishnat ha-Middot" is a purely secular work, and, possibly, it drew upon the same source as did Mohammed b. Musa, the oldest Arabic mathematician. The plea that the "Mishnat ha-Middot" has not been preserved in its entirety, and that in its original form there were references to the Bible for special points, is of no weight, since it is absolutely incomprehensible that haggadic or halakic matter should fit into the frame of the work as it now is. The same reason demolishes the hypothesis of the German translator of the "Mishnat ha-Middot" ("Abhandlung zur Geschichte d. Mathematik," in Supplement to "Zeitschrift für Mathematik und Physik," 1880; H. Schapira, "Mishnat ha-Midoth . . . ins Deutsche Uebersetzt"), who assumes that there was a Mishnah with the Gemara on it, and that citations of the old scholars refer to the Gemara, whereas the printed text represents the Mishnah (compare the tanna Nathan, and Baraita on the Erection of the Tabernacle). Epstein, in Ha-Ḥoker, i. 35.